They have special equipment that makes it as accessible as possible. They also have women-only exercise classes. There is also a crèche. If you or your group would like to try one of these sports - contact the centre and ask for the customer service advisor OR go and have a look for yourself! A personal trainer can be there to support you. There are three pools - the smallest pool is the warmest, there is also a lane pool and diving pool. The small pool and lane pool are accessible for wheelchair users - they both have a hoist. All the pools are on the first floor. There are always trained lifeguards watching the pools. If you want you can have swimming lessons on your own or with a group, to find out more information speak to Sue Clarke. If you want to use the centre more you can become a member for a year. To do this you need to talk to a customer service advisor. This means they help you to get the most out of the gym. If you live in Waltham Forest the staff here can support you to fill in a form for a Forest Connection card - the card helps you get cheaper prices. You need to bring some ID, like proof of disability and proof that you live in the borough. Waltham Forest Pool & Track is a non-smoking area. (On Tuesday, Wednesday or Friday the latest time you can arrive for a swim is 9.00pm). Women only swimming sessions are on Fridays from 4.00pm to 5.00pm. Contact the centre for prices. 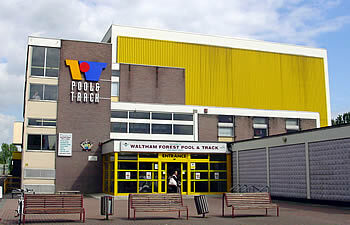 Waltham Forest Pool & Track is in the Chestnuts Showground. Click here to see a map from Street map. There is a large car park at Waltham Forest Pool & Track, it is free. 8 accessible parking spaces are reserved for people with disabilities - they are outside the entrance. 97, 123, 212 or 230 are the nearest fully accessible buses. (Victoria line) - Walthamstow central underground station is about 1700 metres from Waltham Forest Pool & Track. The underground station is not accessible for wheelchair users. Walthamstow mainline station is about 1700 metres from Waltham Forest Pool & Track. Walthamstow Central mainline station has step free access for wheelchair users. To order a ramp for train access call One Railway on 08456 007 245 OR National Rail Enquires on 08457 484 950. The way through the main entrance is flat through automatic doors. There are 2 main floors, the Ground floor and Floor 1. The smallest doorway inside is 900mm wide. There is a reception and customer services area here, chairs and vending machines. You can buy drinks and snacks from the vending machines - a drink costs about £1.00. The gym is on this floor. There is an accessible toilet and a lift to floor 1. They all have lockers and non-slip floors. There is good colour contrast. There is a unisex accessible changing room with a fold-down seat and handrails (and accessible toilet opposite). Groups can also use the bigger accessible changing room, which has a change bed. It has an accessible shower with a fold-down seat and handrails. Because this room is between the Mens and Ladies changing rooms the door is kept locked - so you need to ask before using it. There are unisex accessible toilets on the Ground Floor and Floor 1. They are not locked. They do have handrails. This is a special gym, the staff were really friendly and helpful on our visit. You can get GP referrals from your doctor to join this gym.